A Special and Scary Place. Despite its whimsical name, Shenanigans is not a canyon to be taken lightly. Shenanigans is the middle of the three West Forks of Butler Canyon, in North Wash. It is narrow. The fourth narrows is an awesome slot, 10-12" wide, 100 yards long, and extending upward (without widening) at least 40 feet. I just barely fit. In fact, I have to wait about a year between trips, so I forget just how difficult it is for me to push my body through the narrowest parts. Smaller people have more fun - those larger than my 180 lbs, 5'10" body will not have a good time at all. The fourth narrows CAN be climbed over, but the climb is strenuous and long, and has a couple of exposed, fairly difficult moves. Fun for Mae West experienced canyoneers – not fun for the inexperienced. WARNING! Shenanigans is a serious proposition not to be taken lightly. Should one become stuck, rescue seems unlikely. Assistance from your partners is problematic, as they cannot get to you. Don't be a big ol' fool. If you're too big go elsewhere. If you cannot fit through Main Leprechaun at ground level, don't go into Shenanigans. Updated: The across-the-top option for the fourth narrows is good, but is long, strenuous and requires climbing skill and a cool head. So, if you're a big ol' fool, at least be an experienced, skilled big ol' fool so you can enjoy the canyon. Any team you bring through here, be sure to have some small people that can move back and forth fairly easily. Big people (like me) should have a partner to support them physically and mentally. Assemble a team that includes many small people. Bring as little stuff as possible. There is much sliding, so wear disposable clothing. 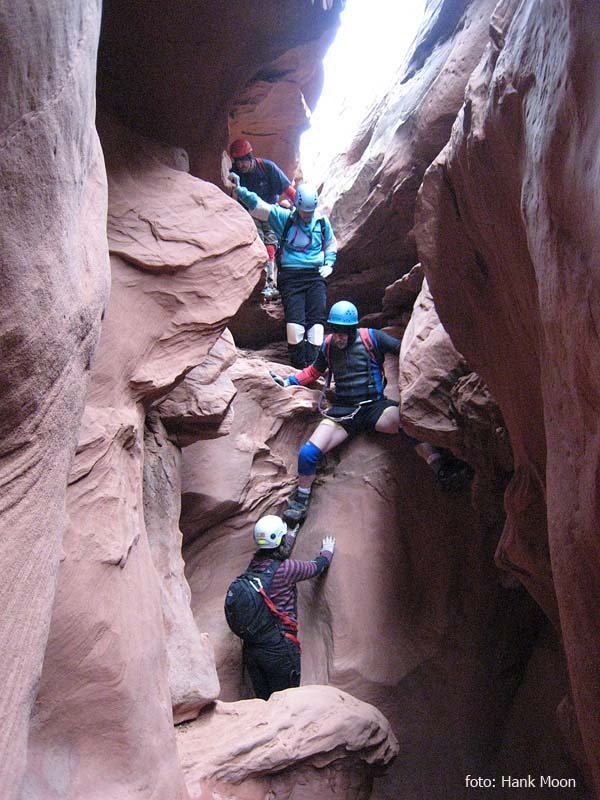 In this canyon, group gear is carried by the smallest people. This is a good canyon to use a tied-webbing harness (a "swiss seat") or a lightweight harness like an Alpine Bod. Harnesses are removed after each rappel. Drybags may be desirable for your clothes; while climbing around the final pool is not TOO difficult, some people slip off and take the swim. Alternatively, packs can be zipped across the pool. With two 80-foot ropes, a guided rappel can be set up on the last rappel. In the 4th narrows, arrange your sequence carefully - pixies in front, trolls toward the back. Each person-who-will-struggle-mightily should have a partner that stays with them. I like my partner behind me, so when I can no longer manage my pack, I can just leave it for my partner to take. In this canyon, the small people get to carry the stuff, and the big people should be left carrying almost nothing. For most of the canyon, I like wearing a thick cotton sweatshirt for padding. For the final section, I strip down to a single, lightweight shirt. This is a natural-anchor area. Bring webbing and rapid links. The fourth section is very narrow. It cannot be climbed over. People larger than 180 lbs will not fit down low. Shenanigans is the middle of the West Forks of the Butler Canyon complex. It is not named on the USGS maps, but is the canyon running south-southwest from near point 5349T on the Stair Canyon quadrangle. The canyon is north and west of point 5143T. Exit from Butler Canyon can be made by climbing out the "Kelsey Exit", a steep, loose chimney with a few climbing moves (that eventually pops out on the rim a half-mile from "The Four-Way"); or by walking down Butler Canyon to Highway 95 at Three Forks. The walk out is 3.5 miles, pleasant but unspectacular. Three Forks is 4.9 miles down Highway 95 from the Bullfrog Road. You may wish to spot a car there. Follow the seismic survey road east. If you ever wondered what the term “cowed up” meant, you can discover it here. Cross the first drainage (Monkey Business) in about 10 minutes, and continue on the road to the second drainage (about 20 minutes). Follow the second drainage south (right) to the first, short drop. Follow the rim on the left (east) downcanyon 50 feet to an easily-downclimbed notch. A short rappel gets us into the drainage. This is really about as short as raps get, but still not really down climbable. John and Alicia watch as Mike does the awkward start. The canyon immediately drops, forming a slot. Rappel off any of several available natural anchors. Leaving a sling should not be necessary. Take your harness off after each rappel. Work your way down the canyon. This part is really fun, with sections of casual walking interspersed with short sections of narrows that require stemming. There is a pool or two that can hold water after rain, and might require wading or swimming. This section divides into three parts, with rests between sections. The third section is a long, sideways-slanted corridor that is strenuous and really cool. After the slanty-corridor, the canyon opens briefly and a sunny spot can be found on the left for lunch. (People who do not wish to complete the final narrows can exit up steep loose blocks on the left (east) and hike back to the head of the canyon). The real shenanigans begin. Back in the canyon, the slot drops steeply. In five minutes, a 30-foot drop is encountered. Sequence people down the drop, then the last person gets to crawl across a ledge ("Grim Crawl of Death") on the right to where chockstone boulders allow the 'last' to downclimb (with a spot from below) or rappel (safer) to the canyon floor. The next part is really cool. The canyon, now deep and dark, winds back and forth making cool twisties. For maximum style-points, crawl through the natural bridge. A left turn marks the start of the final, tight narrows. The narrows is 10-12" wide, 100 yards long and soars upward at the same width for at least 40 feet. Shimmy on through. In general, the floor of the canyon is flat sand and wide enough for the feet, but the location of the floor changes from year to year, and the canyon's difficulty will change as the floor changes height. At a few places, a helmet stand may be helpful. In other places, dropping to one knee and shuffling along, or even dropping to the ground and squirming like a snake may be the best method - but watch out! - getting back to a standing position can be difficult. VARIATION: the across-the-top variation to the fourth narrows is really good, and allows skilled, big-boned people to complete the canyon. When you reach the final, narrow, straight, smooth-floored slot, back up a short ways until it is possible to fairly-easily shimmy up 10 feet. Start shimmying across the top, eventually getting up about 60 feet above the floor of the canyon. This section is long, strenuous, and has a couple of hard crossings of deep silos. (Across-the-top tends to be a lot slower than along-the-bottom). Continue across the top until you are within sight of the ‘fallen-down rock’, then descend to the canyon floor. Lilliputian companions can help you in selecting an appropriate place to go to ground. Eventually, the tightness relents. Climb up on a fallen-down rock and take a gander at "The Final Exam" - a final short narrows section. All but the smallest folks will find it easier to Mae West most of the way across this final section. The final drop can be rappelled in two 50-foot stages. A remarkably-shaped peninsula at the top of the drop makes for an easy bollard to drape the rope around. The upper half can also be downclimbed - it is intimidating but not hard. The lower half drops steeply to the head of a pool. Rig a sling from any of several chockstones and rap down the slot. Swimming the pool can be avoided (for most) by a small holds traverse to either side. Many parties will find it easiest to zip packs down a rope. With 80 foot ropes and a 20-foot length of sling, a low-tension guided rappel can be set up. Hike down the pretty, rugged canyon. Monkey Business comes in from the right a few hundred yards downstream. A little further down, a large arch can be seen high on the right wall. After six-tenths of a mile, the East of the West Forks joins us, and the canyon becomes wider and more open. Another two-tenths downcanyon, a pair of joint-canyons cross the canyon. The canyon/gully on the right (west) is the Kelsey Exit, and is marked by looking unlikely in the lower section and impossible at the top. Hike up into the side canyon / slot and climb up it. Several spots will require careful climbing through remarkably rotten rock. The middle section includes ascending up piles of loose boulders - wearing helmets for this exit is a good idea. Two-thirds of the way up, two exposed step-ups provide access to slabs and ledges leading right (north) to marvelous slickrock bowls. Traverse the bowls and climb up to the rim. Hike north-northwest to "The Four-Way". Especially energetic people can hike west from the top of the Kelsey Exit, and drop down the East Fork of Leprechaun. I woke up feeling mean. The sky did not look so friendly either, so I ducked out and headed home to rest up for a few days. Ram and crew headed off to do Shenanigans Canyon, a canyon near and dear to my heart. Photos by Hank and Bruce. We decided to start the week with a canyon we had looked into recently, but had not explored the upper part of. Unfortunately (maybe), jumping into canyons in this area can be dangerous, and we almost re-created our friends' experience in Sandthrax last fall.